In 2009, a 17-year-old girl and her attorney allegedly told a Tampa police detective that she was driving the car that struck and killed a homeless woman in a hit-and-run accident. The detective issued her a ticket for careless driving, which was later dismissed in court. The detective said he had trouble building a viable case against the teen because of a Florida law guarding against self-incrimination. However, the girl later turned herself in, and she pleaded guilty to an adult charge of leaving the scene and death. She was sentenced to probation in the juvenile system. Florida law requires law enforcement officials to prepare accident reports when investigating motor vehicle crashes. There is specific information that they must include, such as a description of the vehicle involved, information identifying the parties involved, and the parties’ respective car insurance information. Because this requirement may force people to make incriminating statements about the conduct that contributed to the crash, the law keeps this information from being used at any trial (civil or criminal). This protection is called the accident report privilege. In 2017, a 71-year-old man sustained serious injuries when his SUV was struck in a hit-and-run accident in New Smyrna Beach. Luckily he was pulled out of his vehicle before it went up in flames. After fleeing the scene, a 29-year-old woman confessed that she caused the accident, but her statement cannot be used against her and police need witnesses to corroborate what happened. 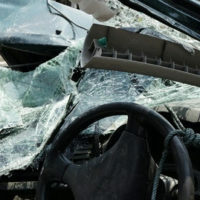 While state law makes accident report information privileged material, it doesn’t preclude subject parties from introducing that information in court themselves. Legal practitioners call this “opening the door.” If someone introduces otherwise inadmissible information then that “opens the door” to additional questions. For example, if a defendant involved in a hit-and-run accident admits in court that she told police about his involvement, then she likely can be questioned about that statement. When a defendant “opens the door,” she waives the accident report privilege. There are also certain exceptions to the accident report privilege. For example, the privilege does not protect statements made in criminal or homicide investigation reports. It also does not protect the results of field sobriety tests, breath tests and blood tests, which are not considered confidential communications. Additionally, there is an exception when the identity of the automobile driver is at issue. But as demonstrated by the examples above, this is still a complicated issue. An experienced attorney can help you build an effective case against the at-fault driver, even if she employs the accident report privilege. Contact a Miami personal injury attorney at The Pendas Law Firm today for a free consultation if you have been injured in a car accident. Our experienced attorneys know how to prepare an effective lawsuit, even with the protections afforded by the accident report privilege. The Pendas Law Firm also represents clients in the Tampa, Orlando, Fort Lauderdale, West Palm Beach, Jacksonville, Fort Myers, Daytona Beach and Bradenton areas.